RESTRICTIONS: Broadcast: NO USE JAPAN, NO USE TAIWAN Digital: NO USE JAPAN, NO USE TAIWAN Hong Kong has announced plans to spend $79 billion to construct one of the world's largest artificial island projects. The Guardian reports that Hong Kong is planning to build 1,000 hectares of artificial islands off the coast of Lantau Island. The project, called 'Lantau Vision Tomorrow,' is more than twice the size of Dubai's Palm Jumeirah, which was also created by land reclamation. According to the South China Morning Post, the first phase will provide up to 260,000 residential units, 70 percent of which will be reserved for public housing. A new transport network is also being built, which will include road and rail links to connect the future man-made islands to Hong Kong Island, Lantau, and Tuen Mun. The plan has received criticism from environmental groups, who say the building work will be damaging to local species such as the endangered pink dolphin. The Guardian reports that Greenpeace and the World Wildlife Fund have argued that authorities should instead develop former industrial areas called brownfield sites, arguing that it is cheaper and less harmful to the environment. Reclamation work on 'Lantau Vision Tomorrow' is scheduled to begin in 2025, with the first residents expected to move in by 2032. Artificial islands off the coast of Lantau Island in Hong Kong 2. 260,000 residential units to be built on the artificial islands 3. New transport network connecting islands to Hong Kong Island, Lantau, Tuen Mun 4. 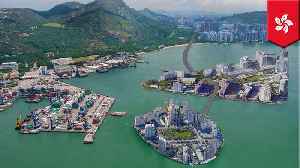 HONG KONG — Hong Kong has announced plans to spend $79 billion to construct one of the world's largest artificial island projects. The Guardian reports that Hong Kong is planning to build 1,000..